If I disconnect the electrical connector at my EGR, do you think it would go full Open or full Closed? 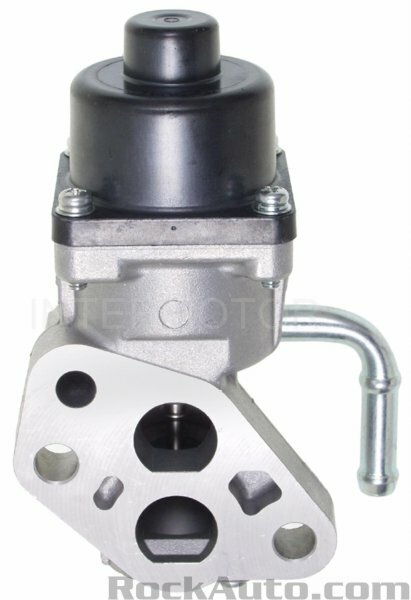 Looking for a way to temporally disable EGR, and have it stay Closed. Note: yes, I expect it will throw a code. Edit: I think you could get away with the beer can method on the Fofo if you needed to (pic below). Might be a good idea to take it off and clean it out as it could be more the source of your problem than it's functionality. Same goes for your throttlebody; if there is gunk on the back of it clean it off using a rag while holding it open or pull the TB and do a more thorough job. TB is clean/was clean last year, will check it again next few days/weeks. Great idea on EGR internal cleaning. Chances are no human has been inside there since 2003. Cool pic above. After cleaning, might do the beer can trick as things progress; do it for a day or two as a test.... thanks again. Anyone here seen EGR valve get gunked-up and cleaning fixed it, or seemed to fix something? When I had my IM off, I saw the inside of the EGR tube and it was dry as a bone, suggesting my EGR gasses have no oily residue at all. Also, where EGR tube meets the inside of IM, it was totally dry. My guess was EGR would go full Open if electrically disconnected. IF I had a EGR mod/delete blanking plate mounted, I could watch it operate and answer my own question fer sure. Hey Mike, I think your EGR picture just answered my question. I think I can see the (spring loaded?) plunger resting in the down position (is fully Open) so it must do this/probably does this when no power is applied. I will confirm this on mine when I clean it. Edit: Wait, i think my eyes are deceiving me. Now I am unsure. Sorry. Last edited by spacemanspif; 04-29-2015 at 04:50 PM. Don't forget about coolant leak when removing it. Coolant flows from head through small hole into EGR, then out through the attached hose (see tube in picture). I'd bet on default closed, typical for EGR's & lets the engine run best if it fails. Fine. Have it your way. I will take solar flares off my list. I was curious about what it did while the engine was running, and what it would do if I pulled the plug. This is not a case of me asking un-necessary or un-natural questions or being lazy. The question evolved and after seeing your pic THEN IT HIT ME that I could just pull the EGR off the car and look to see if it is open or closed when at rest... and this would answer my question. BTW, what's a wrench? For whatever reason, you and I are not seeing it the same way. Plunger down = the two cavities are connected = open. Plunger up = plunger is in the middle = the two cavities are not connected = closed. Face-palm! I knew about the coolant, but forgot about it when considering blocking the exhaust ports with beer can idea. Pretty sure it would leak coolant + might mess-up the seal/gasket if I did it, so that idea is scrapped. I will post back after cleaning it and confirm which state the valve is in when at rest. With no power, the plunger is spring-loaded Closed. Good guess sailor. I was able to get a fingernail on it, and move the plunger, which gave me an idea of how much force/drag a new one has. The spring is not weak nor hard. Hope mine has similar behavior once I get around to cleaning it. Because of this news, plans to clean my EGR are postponed. When I want to eliminate EGR gases from going into my IM, I will just pull the connector off... assuming my EGR is not stuck open (return spring not working!?) this will work. Will do this temporarily as part of my troubleshooting process regarding engine performance problems in another thread. Now I am waiting for our standard hot days (100-105) that will better help me reproduce the bog and stutter symptoms. Thanks for your help gents. I'd just remove it all together & replace it w/ a plate. Use a hose connector to connect the heater hoses together.